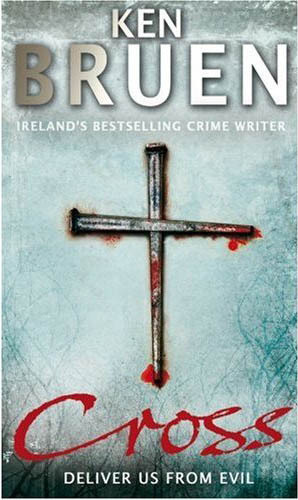 CROSS is the sequel to Ken Bruen's brilliant novel PRIEST, which I rated as one of my top five crime fiction reads of 2007. Then a young boy is crucified and Ridge, Jack's lesbian friend in the Garda asks him to investigate the case as it would be a career-maker for her. She is also worried about the result of a biopsy for breast cancer. Jack is also asked to investigate the disappearance of dogs from the Newcastle area and employs a drunken ex-Guard named Eoin Heaton for this task. When the crucified boy's sister Maria is burned to death in her car, and Eoin Heaton turns up dead in the canal with a dog tied to him, Jack Taylor, the one man disaster area, realises he is facing true evil, and needs help from his former drug dealer to deal with a psychopathic family bent on revenge and retribution. Ken Bruen has written yet another brilliant book with his protagonist Jack Taylor able to speak for all those people who have been left behind by the complications of modern society. His books are chock full of interesting, sharply drawn characters and feature pithy word pictures that bring the people and their situations to life: Father Malachy the pathetic priest for whom 'life is an irritation between cigarettes', "An Eastern European named Mikhail, who depending on the day was Russian, Croatian, Romanian and other nationalities I couldn't pronounce, held court at the table by the window" and the little Irish mother Mrs Heaton, "Would you like a drop of the creature?" The plot seems merely a vehicle for the sparkling dialogue and internal philosophising of Jack, '….that the Galway light will always hold that beautiful fascination and that priests are our protectors, not predators', who seems to be surrounded by almost constant misery. I handed over a twenty euro note and she said it was far too much. I told her to put it in the poor box. She allowed herself a smile. "Oh, we don't call them that any more, we say the disadvantaged." There are times when Jack is merely reacting to events and appears lost in a world he no longer understands. Perhaps that is why Ken Bruen, who has such a brilliant way with words, is now billed as Ireland's best selling crime writer because after all Jack Taylor is not alone in his despair. Countries have been conquered and divided up before in history but reading Ken Bruen one gets the impression that this is the first time a country has been given away. If you haven't read Ken Bruen yet you are missing some the finest crime fiction being written today. It is not gentle like the Irish rain but harsh like Ireland's history, enjoy it.